Pakistani rights activist Malala Yousafzai is meeting Nigeria‘s President Goodluck Jonathan to press for more action to free the more than 200 girls held by militant Islamists. The militants’ leader has reiterated in a new video message that he is prepared to negotiate a prisoner swap for them. Correspondents say that Mr Jonathan’s government has faced strong criticism for not doing enough to curb violence by Boko Haram, especially in the wake of the kidnappings. 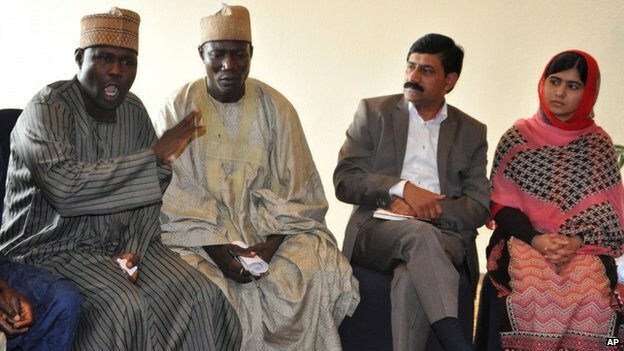 Malala has already met relatives of the girls, expressing solidarity with them at a meeting in Nigeria’s capital, Abuja, on Sunday. 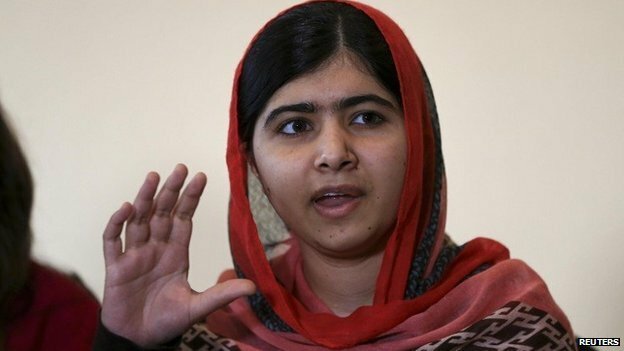 “I can feel… the circumstances under which you are suffering,” Malala said. Two years ago, Malala was shot in the head by Pakistani Taliban militants for campaigning for girls’ education. On Sunday, Boko Haram’s leader Abubakar Shekau released a video mocking the “Bring Back Our Girls” social media campaign pressing for the release of the more than 200 girls it is holding captive. 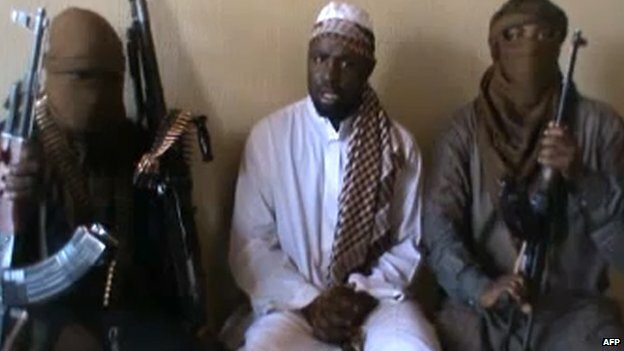 Underlining Boko Haram’s offer for a prisoner swap, he promoted his own slogan: “Bring Back Our Army”. Mr Shekau, near the beginning of the video, described several of the world’s most prominent militant Islamists as his “brethren”. 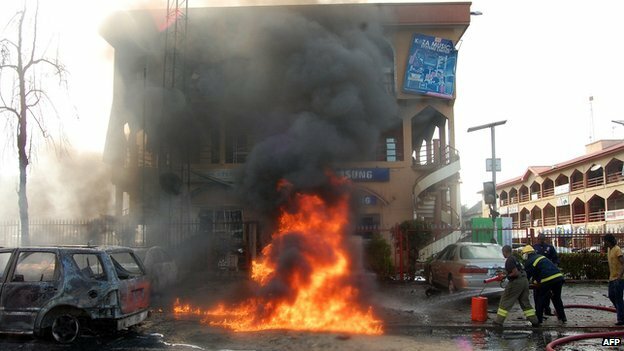 He also said that Boko Haram was behind several recent attacks, including the bombing of a shopping centre in Abuja, which killed at least 21 people. Boko Haram, which means Western education is forbidden in the regional Hausa language, launched an insurgency in Nigeria in 2009 to create an Islamic state. It took the girls hostage during a raid on their boarding school in the north-eastern town of Chibok in Borno state on 14 April 2014. 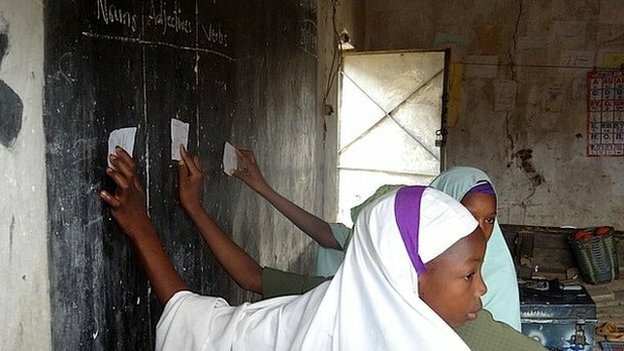 The government has rejected Boko Haram’s proposal to free its fighters and the women and children it is holding in exchange for the release of the girls. Posted on 14th July 2014 by newsafrica. This entry was posted in #BringBackOurGirls, Africa, African Security, al Qaeda in Africa, Boko Haram, Malala, Nigeria, President Jonathan and tagged Abuja, Boko Haram, Chibok, Goodluck Jonathan, Malala, Malala Yousafzai, Nigeria, Taliban. Bookmark the permalink. « Mugabe, the international outcast?